Some of our hand-picked and bespoke Day Trips to choose from. You may either book independently or combine with your package tour. Our scenic heli tour begins at Paro valley flying low over farmhouses, rice fields and meandering Pachu river. Enroute we cross over ancient Dzong or fortress and Taa Dzong, the national museum. You can also have a close look of the world’s famous Tiger’s Nest Monastery. We then fly north along Pachu river above ruins of Drugyel Dzong and 7513m high mount Jumolhari, one of the highest virgin peaks in the world. The other peaks seen are Jichu Drake and Tsherimgang. The helicopter will then land at the Jangothang base camp for a quick photo moment. If you are lucky you will see herds of blue ship. While returning, helicopter will overfly turquoise lakes hidden in rocky mountains. This spiritual hike to Bumdra starts from a monastery above Paro valley. The 2-hour uphill hike is through forests of pine, spruce and fir with an amazing views of valley below. The trail then undulates to a pretty temple, which offers commanding views of Paro and snowcapped Himalayas to north. We then come to a wide meadow dotted with sacred chortens and prayer flags, and a little further is a place where we camp for a night. Experience our luxury camp and delicious meals. The camp is tucked away just under Bumdra monastery, which is believed to have been blessed by one hundred thousand angels. Venturing further up for another 40 minutes above the camp will take you to the top at 4200m. From here you can enjoy unimpeded views of the Himalayan range. The trip starts by driving to Chelela, the highest pass on the entire motor roads in Bhutan. 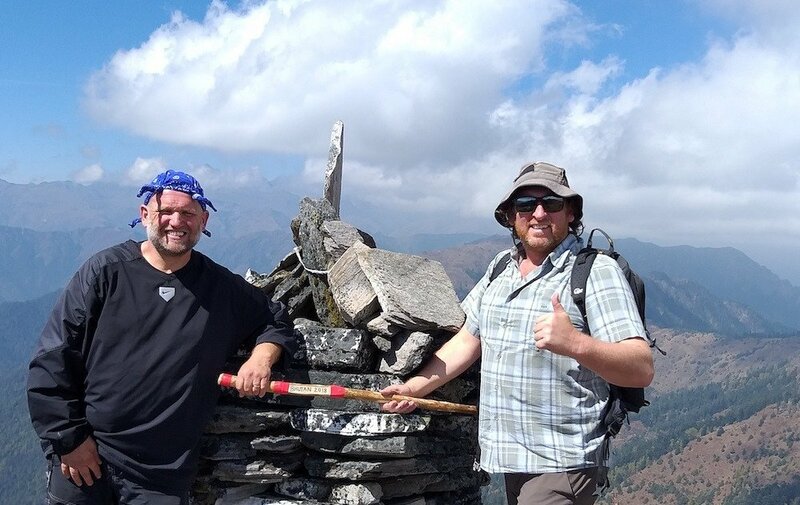 After a brief photo stop at the pass, you will walk along the prayer flags festooned ridges with views of Haa and Paro valleys amazingly becoming more conspicuous as when you climb one ridge after another. On clear weather, you will also be greeted by awesome views of Mount Kanchenjongga in Sikkim and Mount Jumolhari and Jichu Drake in Bhutan. After hiking for 2 hours, you will reach at the top of the last ridge Kungkarpo situated at 4300m or 12900 feet from the sea level. Buddhists use this place as a sky burial for dead infants. To be more adventurous, you can walk further down the ridges towards Haa Valley. The view of valleys beneath, yak pastures and near by mountains are breathtakingly superb. The highlight of the hike is a 52 meter high Buddha statue, which is famed as the tallest bronze Buddha statue in the world. After spending some time enjoying the statue and inner shrine, we begin our hike around the statue within 493 acres of forested area of Kuensel Phodrang Nature Park. Starting from the left side of the statue, we circumvent along the trail through lush vegetation. You can summit several gazebos overlooking the bustling Thimphu city and surrounding valleys. You will descend along the northern side of mountain making 5km hike once you come back to the same start point.